Owned and used daily from 1985 to 1995 - 100K miles, no mechanical problems. 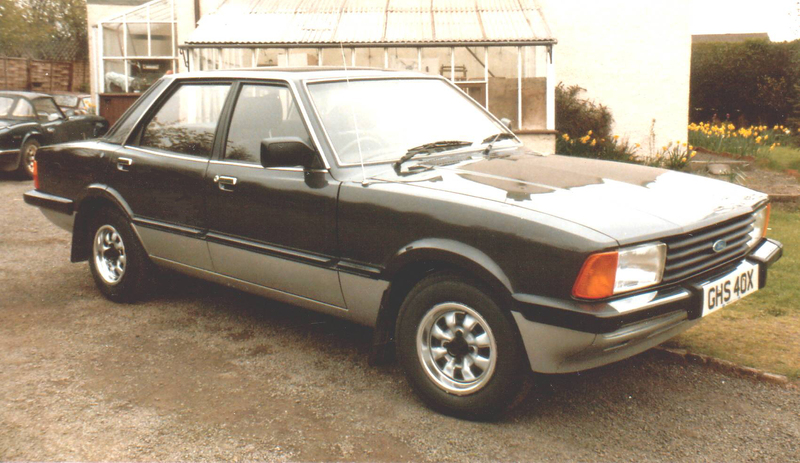 This facelifted version of the MkIV Cortina was officially called the "Cortina 80", it had different lamps front and rear, a squarer roof line and a number of fairly minor mechanical differences. The mechanical changes included the introduction of the VV (Variable Venturi) carb. which got itself a poor reputation but actually was reasonably trouble free - it ran lean and gave good fuel consumption but poor performance. A self adjusting clutch cable assembly was also added and this could be very awkward to repair if any of the plastic parts failed. This motor had everything as standard that was extra on the '78 L MkIV version that I used to drive. Only real fault was that after only about 2 years the chassis legs had rusted through - this was a common problem and is supposed to have been due to Ford storing these parts in a field for years and then using them without any decent rust proofing. I had waxoyled everything when I first got the car but it did not make much difference to the corrosion - it was already well set in. In order to gain some performance I fitted a twin choke Weber carb and manifold from a Mk III GXL 2 Litre (with the correct jets fitted) and a complete Janspeed exhaust and tubular manifold. This made about 10mph difference on top speed. I did have a broken cam belt at about 50,000 miles which I was told would wreck the engine but in fact did no harm at all and was quickly replaced - I had been carrying a spare and intending to replace it for about a year! By the time it was about 13 years old it was so rusty around the front wings and the door bottoms and was also beginning to smoke a bit, that I scrapped it. OHC 1593 cc Pinto engine. Modified with Weber twin choke carb. and Janspeed exhaust. Coil spring suspension with solid rear axle. Quite soggy handling but comfortable. Rust prone due to poor protection from new.